Can twists “detox the liver”? Yoga teachers and yoga students like to be proactive when it comes to our health – we have strong opinions about what we should put into the body, how to improve its functioning, and how to cleanse it of unwanted stuff. Unfortunately, in our quest for conscious living we sometimes make far-fetched assumptions. Case in point – a widely spread idea that twists help “detox the liver.” I believe the thinking goes like this: liver removes toxins from the body + twists squeeze the internal organs (including the liver) -> this increases circulation to the liver -> this makes the liver work better = twisting helps remove toxins. Intuitively it makes sense; it’s too bad that it doesn’t work like that in real life. Let’s explore this interesting equation one part at a time. Statement 1: The liver removes toxins from the body. Yes, this is true. The liver is a remarkable organ that has many different functions (come to think of it, which organ isn’t remarkable?!) One of those functions is toxin removal. 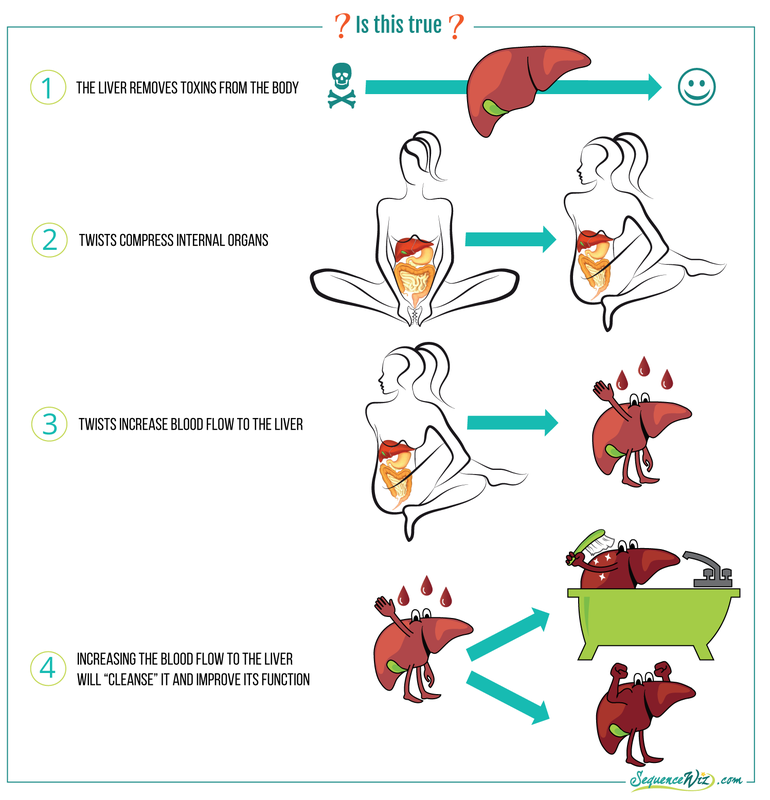 The liver does it in two ways: the toxins that are water-soluble are removed from the blood stream and are either broken down or excreted in the bile and urine. The toxins that are lipid-soluble are “absorbed by the liver and stored in lipid deposits, where they do not disrupt cellular functions.” (1) This means that it is your liver’s job to remove the toxins that are possible to remove, and store away the ones that cannot be removed so they don’t cause harm. Any healthy liver will do that. Statement 2: Twists compress internal organs. Yes, this is true (to a degree). Certainly, when you twist, the contents of the abdominal cavity are compressed, but it isn’t like you put your liver in your hand and squeezed it. The liver can move upwards to accommodate for the abdominal compression, similarly to what it does when abdominal contents are compressed during pregnancy. (Read about the difference in organ mobility (ability to shift position) and motility (the movement within the organ). Statement 3: Twists increase blood flow to the liver. There is no proof of that. Organs are not muscles; they do not work the same way. We contract the muscles to increase circulation within them, but you cannot contract your liver at will (thank goodness!). Statement 4. Increasing the blood flow to the organ will improve its function. There is no proof of that. In fact, increasing the blood pressure within the liver is not a good idea. The blood pressure within the liver is usually low (averaging 10mm Hg or less). If the pressure rises, “small peripheral veins and capillaries in the portal system become distended; if they rapture, extensive bleeding can occur”(1) Now, twisting won’t cause that, of course. This sort of pressure increase is usually a result of a blood clot or damage to the organ. It just proves that we need to let go of this idea that we need to increase circulation to the organ any way we can to improve its function. Sometimes we forget that the state of homeostasis (internal balance) within the body hinges on a delicate interplay between different forces, including pressure changes, fluid regulation and waste removal. It seems pretty cavalier to think that we can just barge in and begin to manipulate organ function, telling the body how to do its job properly or rushing the process. It appears that the term “detox” is being widely used in yoga classes in metaphorical sense. Shirley Archer, an author and spokeswoman for the American Council on Exercise (ACE) says: “Better circulation equals better health. If detox means to eliminate from the body what it no longer needs, then certain yogic practices can help.” She talks about emptying the lungs of unneeded carbon dioxide and detoxing one’s attitude by staying in the present moment, as other methods of “cleansing”. If we do that, we need to be sure that our students know that this is a metaphor. Otherwise we are spreading misinformation and undermining the depth and substance of this great tradition. There is no need to “oversell” yoga by making far-reaching claims – it speaks for itself for those who practice consistently. It is kind of sad that students tune us out. After all, we say those things for their benefit (or so we think). Next week we will explore the claims about twists and digestion, and for now what if we cut down on the “claptrap” and focus on the things that a student can actually experience?! Thank you again for a common sense approach to yoga! I also check out when teachers make misleading, unsupported claims about the benefits of yoga. As you said, there’s really no need to oversell it. Always glad to read your common sense viewpoint along with what supports it. Love the little liver guy taking a bath too! Thank you, Olga. Great article! I personally feel so frustrated if I go to a class and hear all these unsubstantiated claims being thrown about. As you say in the last paragraph, the benefits are evident in how you feel, why do we as yoga teachers feel the need to oversell??? Thank you Angie! My thoughts exactly! Olga, you are taking the Western approach of dissecting an “Eastern” modality down to just one element to dismiss a benefit of an entire approach to wellness. Anyone can do that. It is like stating that Aspirin cures a headache. No, it does does not. It covers up the symptoms to help you until you can get to a specialist (like me, hehehe) to help you treat the source of the headache. I am not sure if that is the best comparison but hopefully it shows the difference between one element and the whole act of improving your health. #2 hurts your argument because you are using upward intra-abdominal pressure to negate the benefit of twists. Those are two different forces. The twists may help open up structures that are compressing the Liver. My 11 years of bodywork experience says that most of us have excessive tightness around our liver from depressed sternums, slouching, and torsion in our torso. Unfortunately we have 24 levers, aka ribs, that are stuck in the pattern and working against. Using the correct PASSIVE twists to attempt to open up overall space may be able to help the liver. #3: Maybe not directly, but anything that promotes relaxation helps to stimulate the parasympathetic nervous system. . . and your organs. There is another form of circulation which may be improved in the liver and that is the concept of the movement of stagnant Qi/Chi. According to the argument you are trying to make, modalities like Tai-Chi and Chi-Kung should be even less effective but they have been proven to be beneficial. #4: The statement “Increasing the blood flow to the organ will improve its function” is at least true for other organs. (Do you want to make sure you have enough blood flow to your heart and brain or are you willing to settle for less?) Everything that follows it might be true for the liver but does not disprove the generality of the statement. I think I have already made this long enough to skip the quotes thrown into the article. In (the John Barnes approach to) Myofascial Release, we study about how going deeper into a compression/torsion and holding for a release in the connective tissue actually does help to “unwind” the area. We often do this, first, before trying to create space in the area. This is best done passively to bypass the muscle tension barrier in order to access the connective tissue barrier. Any release that is created also happens inside the organ/tissue cells because our fascia extends through membranes as the cytoskeleton. Any change in the connective tissue that we can create leads to improved cellular structure and functioning. Therefore, regardless of what is happening to the blood (vessels) inside the liver, we can improve cellular functioning/detoxification within the liver through twists/stretches. Any “toxins” trapped within the ischemic tissue enter back into circulation to be processed and/or eliminated. As for what type of Yoga twists. . . I think that the more passive/Yin twists should be the most effective for detoxification based on my preceding paragraph. Hi Pal, thank you for you detailed comment! The things that you talk about are an example of what my teacher calls “mixing models”. There is a Western model of approaching things, and there is an Eastern one. My post was focused on the Western approach. Talking about it this way in no way negates other more subtle ideas that are present in the yoga tradition, like the ideas of prana and vayus and so on. I believe that when we talk about subjects like that we need to differentiate between what can be proven scientifically and what cannot be proven. For example, yogis believed that you could direct the flow of prana to any organ by simply bringing your attention to it, because energy follows attention. I think where we get confused is when we start treating more subtle layers of the system (like prana, chakras, etc.) as if they were part of the physical realm (like circulation, actual organs, etc.) And you are making an excellent point about parasympathetic activation; we will be talking about it next week in regards to the digestive system. And the argument of “Do you want to make sure you have enough blood flow to your heart and brain or are you willing to settle for less?” is exactly what I was talking about – your body takes care of it perfectly fine, unless there is damage to the organs somewhere; our bodies do know how to do their job. I cannot comment on Myofascial Release techniques since it is not my area of expertise. If you send me links to actual studies that support those claims, I would be happy to include them. Hi, Olga. You do negate other approaches when you dissect them down to their individual components. They are meant to be done in their entirety to create change in the body which is what my first paragraph was about. Of course twisting alone is not going to be of much benefit. . . unless you do it correctly. . . which was my final paragraph. I am not “mixing models”. I am talking 100% from a western perspective. The only brief mention of Eastern thought is in mentioning Chi in discussing your statement #3. But, Chi isn’t purely an Eastern concept anymore. It has been proven that the Meridians of Ayurveda and TCM deal with nodal points in the fascial system. And, it has been proven the fascial system transmits energy (see video link further down). This method of energy transference that runs through every cell of the body is known as mechanotransduction (http://www.sciencedirect.com/science/article/pii/S1360859208000788). It is a real western term. There is no longer is a mixing of models when talking about this flow of energy unless you start using terms like “elements”, “doshas”, etc. If you want proof that connective tissue is continuous with the cytoskeleton, check out the amazing pictures at http://bscb.org/learning-resources/softcell-e-learning/cytoskeleton-the-movers-and-shapers-in-the-cell/ and you might visually start to understand interconnectedness of what happens inside and outside our cells via tensegrity. One model/description for how cellular processes are affected by tension/stress within the fascial system is called the neuro-fasciagenic model (http://www.bodyworkmovementtherapies.com/article/S1360-8592%2815%2900056-X/abstract) and it has indeed been proven to affect cellular processes http://onlinelibrary.wiley.com/doi/10.1002/jcb.240550104/full). It all has been proven. There are now research organizations like the Fascial Research Congress, Fascial Research Project, and Fascial Research Society that are dedicated to it. You are taking my heart/brain statement out of context to try support your own. Although, I did not expand on it enough to clarify what I was trying to say. Probably because I was on a roll and getting sleep deprived staying up way too late (or early) reading your article and typing up a response. My main point is that if an artery to an artery gets clogged, you are going to have a bad day so you probably want to keep as much blood flow to them as possible. Being more parasympathetic is not going to help you for this situation. If your liver blood flow information is correct in your statement #4 section. . . I am talking about how downward pressure from a depressed ribcage, torsional forces from body torsion, and upward pressure from slouching (and other things that create upward intra-abdominal pressure) can squeeze on the liver with the same tensile strength of steel. Circulation inside the liver, as well as other organs, is affected just as is compressed sponge that is not allowed to re-expand to fully hydrate. As for why I defend slower and more passive stretching/twisting techniques, please check out one of the proven dynamics of our connective tissue that is known as Thrixotrophy. I have a page about it on my website http://kokitymassage.com/balls/approach/ that talks about why slower rolling/massage techniques generate better a response from our tissues. This same principle can be applied to doing passive stretches/twists to help release deep into every aspect of your body. Hi Pal! Thank you for taking time to list those references. I checked them out and still couldn’t find anything that said anything like “Tight fascia impedes liver function and gentle twists restore that function.” So to me it’s still an assumption. So for now it seems that we both will keep our original opinions and folks who read this post can decide for themselves. Cheers! Olga, I just provided you with supporting documentation that every cell is interconnected and how circulation and cellular functions are affected by strain on the system. I also introduced to you to you the principles of how tissue (and organs) release through the dynamics of Thrixotrophy. . . that you can create change in the state of a colloidal substance, aka our tissue, through slow sustained pressure. The faster/more aggressive you are, the more it will fight the release. It does not matter if we are talking about muscle or organ tissue. I was hoping you could connect the dots. Passive stretching/twisting allows you to bypass the superficial muscle tension level to engage the fascial barrier. Once engaged, a vibration begins to resonate through the fascial matrix. Once it reaches the right resonance, the matrix re-patterns and releases the strain/trauma/”toxins” in it. How long that takes depends on a number of factors. In JB’s myofascial release classes we are taught to hold a technique for 5 minutes to allow the fascia to release. It is proven that around that time vaso-dialators and anti-carcinogenic immunoglobins are released to help facilitate healing. Regarding the toxins released during this “unwinding”, we can often smell anesthesia, salt/chlorine water (from drownings), and other odors finally leave the body. Now, back to the passive yoga twists/stretching, everything I just described above can take place if you execute it correctly. Unfortunately the only part of the fascial system that makes it into Yoga is its anatomy ‘trains’. The amazing dynamics are totally overlooked. The only yogis that I hear talking about feeling the thrixotrophic and spontaneous releasing of the connective tissue are those attending Yin yoga and some restorative classes. Brilliant article again, thank you. It is the unfortunate truth that yoga training courses teach some very ‘bad’ science, as they are generally written by people with limited knowledge of physiology. New teachers then go into classes and repeat what they’ve learnt in the course and the incorrect information is perpetuated. It is so refreshing to read your analytical and science based pieces. HI, Olga, interesting post, again! I wanted to ask you opinion on the JPP (Jathara Parivartanasana Parsva) that is often prescribed for liver cleanse in the Krishnamacharya Yoga Therapy tradition. Are you familiar with it? thank you for an informative article. I find myself going to workshops and classes with my skeptic filter these days. As to another commentator who was arguing about eastern vs. western thought – at least have some actual studies (as opposed to anecdotal evidence and personal experience) that support the claims. 🙂 Welcome to our community! Thank you Pal Kokity for taking the time to describe and break down the dynamics of how yoga works energetically in our bodies and how twists CAN contribute to reestablishing healthy liver function by releasing stagnated energy. Rather than “keeping your original opinion” olgakabel, perhaps it would be more respectful and you would be more respected if you were to express gratitude to Pal for helping you and others to expand their knowledge on this topic. Put downs are just not helpful. Or is that yoga “claptrap” too. Peace.